On Rasmus, Scott and I were tea drinkers. This was not by design (despite the fact that my mom is British and I was raised on tea), but by default. We left with a French press and had planned on making delicious, fresh coffee to keep us up during those wee-hour night shifts and jump start our lazy mornings in sleepy anchorages, however that didn't last long. 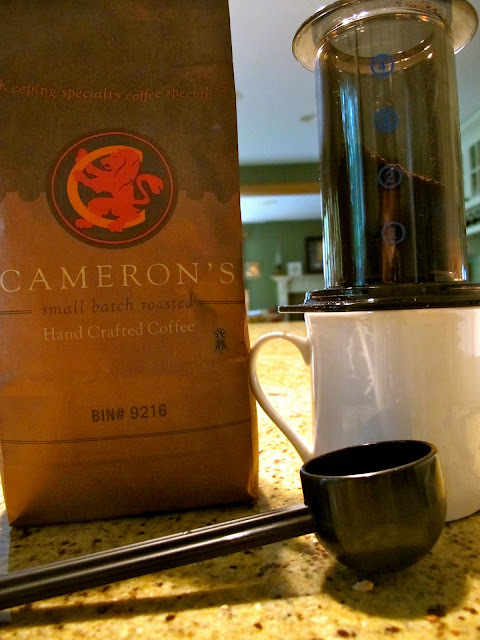 The first (and only) time we used our French Press was on the Erie Canal. I remember it well. I don't remember the coffee, mind you, but what I do remember is the mess I had to clean up afterwards. Those coffee grounds clung to that French Press for dear life and it took a tremendous amount of water to clean the contraption and rinse all of the rogue coffee grounds out of the sink. On a boat where water is a precious commodity, I deemed at that moment that we would be tea drinkers. And tea drinkers we were, until now. I get a lot of emails from marketing companies and such offering us free products, gizmos and/or offering payment in return for blogging about their resorts or companies. Most of the time, I don't accept (when I do, I tell you). If the company or product is not something I have had personal experience with or would use myself, I politely decline. But when the folks at Aerobie contacted me about their AeroPress Coffee and Espresso Maker I thought twice before I said "no thanks" - and I am so glad I did. This thing is the BOMB! French press, move over! The AreoPress is in town! Long story short, I am now a coffee making fool. If you pay us a visit these days, you get a cuppa joe made by yours truly - I love it that much. My dad is particularly fond of this arrangement, being that he loves coffee and I now love to make it. It's easy, it requires no power, it takes up hardly any space, and it's good. Really good. Perfect for the boat. The Aeropress works similarly to a French Press, but without the mess. You put the fine-ground coffee into the big plastic cylinder, set it atop a coffee mug, top off the plastic cylinder with boiling water, mix for 10 seconds and then push down the steaming contents with the plunger-type insert until you bottom out at the filter. What results in the mug is one seriously tasty cup of coffee. Depending on the coffee-to-water ratio, you can make espressos, lattes or whatever type of brew your heart desires. The best part? The used up coffee grounds just pop out of the bottom into a garbage can and one quick rinse later, you're good to go again. It is so easy. If my instructions baffle you, check out this Youtube Video on how to use it. I can PROMISE you, this is one product that will make it on to the new boat. As for my dad, he's now a total convert and has an AeroPress on order for his boat. And now I have to run, dad is watching the olympics and has requested his "evening cup"! Once you do one of the above, you will be entered to win! I will draw the winner on Monday and I seriously cannot wait to get one of you guys this awesome coffeemaker - you will NOT be disappointed! I have been searching everywhere for a coffee maker that will work on a boat! I have 3 fails piled in my pantry... So happy to hear of 1 that works - thanks for spreading the word. One of my friends has this press and brought it with her to the BVIs when we did a sail trip. We all wanted coffee from her every morning because it really does make the best coffee. And you're so right about being easy to clean. Mmmm...coffee... My currently preferred method of making coffee is the coffee siphon, or vacuum pot. Unfortunately, its probably even LESS conducive to use on a boat than a french press. The AeroPress looks very interesting! A no-mess coffee press? I'm onboard! Now I have to say that I drink my coffee every morning and double on the mornings I have to fly. Being as you would want your airline pilot very awake and caffienated, I am sure you want this to go to me right? Even if it doesn't I will look into buying one. Gotta have one for the boat and one for home! I would love to give this a try! I'm going to look at a 25 foot Westerly sailboat (our first sailboat) and space will be at a premium!! I make instant coffee on my boat. This has got to stop. I find that I sail better if I drink better coffee. That would be incredibly handy in our motorhome when we are drydocked (without shore power) and it's too early to run the generator. I cannot get going without my coffee in the morning. Love, LOVE our AeroPress on the boat...so much that I bought one to use at work as well. I would have killed for a product like that while on our passage from North Carolina to Florida. The perk-a-lator takes forever and makes a mess, this would be perfect. Ecco la mia risposta in italiano...Mi piace una tazza di caffè al mattino, perché io non riesco a funzionare senza di essa! Click on my userid and you will see that I have your blog referenced! Have fun with this contest Brittany! I am going to order one of these babies on your say so! I love coffee. If I don't get my morning fix, I'm cranky and no one likes me. If no one likes me, then I have no friends. If I have no friends, then who will I share my Aerobie coffee with? We are definitely gonna have to get one of these! I'm trying to scale down all of our home furnishings to move onto the boat, and I'm having a heck of a time! This will help! Id love to have this-my day doesnt start until the coffee cup is empty. I love the idea of this. I too loathe cleaning out our french press. The grounds end up building up in the bottom and it is impossible to get them out! In our boat there is a serious need for coffee. My man needs coffee in the morning the way meth addicts need their fix. It. is. insane. Anyway, I would love this and if I don't win I will likely buy one in the future. Thanks for sharing. Unfortunately, my French Press lost out to time and practicality. Worked best with fresh ground coffee. Windtraveler Brittany may be on to something here. We will definitely have to give this a try. The cool thing about this method is I can still buy fresh roasted beans and then grind them as needed to be used in this product. Coffee immediately begins to lose flavor when it is exposed to air so we're big believers in keeping the beans in an airtight container and grinding right before use. Since we're not so rich that we can own a boat big enough to accommodate a $4000 espresso machine we'll just have to suffer through with getting our caffeine fix the best way we can. :) Thanks for the product introduction. i have 2 kids under 5 years old. Coffee is my lifeblood. What a coincidence! E & I LOVE coffee, and our last sailing/camping expedition to Baja had us drinking tea for the exact same reasons you cite. We have used an aeropress before, and loved it. Great tasting coffee. I'm so glad you like it - great post and awesome giveaway. Sounds like a great alternative to the messy (and perhaps dangerous) perculator that we considered using from our camping days. Maybe we'll win, but if not we need to add this to our list! Of course I love coffee ... and currently just use a simple drip basket on our boat. This looks to be a great option and far better than my breakable "Glass" French Press that I have stuffed away in the cupboard at home. I'm anxious to win this and add a review on MyDesultoryBlog. Love morning coffee on the boat! I have been using a stainless steel french press aboard, but we live at the dock with an endless supply of fresh water to clean it. I wish I had time to buy an aeropress before we leave on our 3 week mini-cruise around Catalina Island tomorrow! Thanks for sharing this awesome gadget. I love coffee because it tastes good - there, is that enough to get me entered in the sweepstakes? I have added your blog to my "Dont Miss These" section. Thanks for the tip on the coffee maker - synchronicity perhaps because my espresso machine quit working this morning. Keep us posted about how the new boat turns out. Looks like a great choice. The only thing I love more than reading Windtraveler at work (hey - it gets me through the day) is drinking coffee. I have a coffee addiction. Seriously! It's not a bad thing though: I can quit any time. Really. I can. I just choose NOT to. Ordinarily I'd like you to feed the monster and send the press my way, but next to drinking coffee and reading Windtraveler, I like reading about S/V totem...and if I were to win I'd donate the press to Behan (s/v Totem). They clearly need it more than I do in order to stay awake during those long overnight watches. Shirl and I were discussing how we are going to make coffee aboard Serenity just yesterday. We purchased our boat on June 1, 2012 and will be leaving in late September to cross Lake Erie, travel through the Erie Canal, down the Hudson, and south. Your blog posts about your trip have been very helpful. Thank you! I have a blog as well...it is surprising how many people are interested in cruising . I would love to win as we are currently equipping our boat for the trip. A good cup of coffee would be great on those cold mornings on the Erie Canal. So glad you did this. I couldn't agree more about the mess with a traditional coffee press. It's steered me away from them for a long while. But let's face it, my battered old aluminum Coleman drip coffee maker is on its last legs. So off I go to the blog to post! This is one of the coolest things I've seen. I glanced over them in the past and never paid much attention until now. What got me is the water vs French press argument. Since I can't go without my coffee and we won't have super enormous water tanks on the boat just for rinsing French presses...this little jewel has been added high on the must get before we cast off list! We stopped using the French Press aboard Scout for exactly the reasons you stated- a pain to wash out with minimal water reserves! I'm embarrassed to say we now use the little coffee bags which are ridiculously expensive, and only taste bearable! Thanks for you great blog! Thanks for the info! I'm a tea drinker, but my husband has to have his coffee. I was going to buy a french press, but this sounds like a much better option. Thanks! We just bought our first boat, and can't wait to enjoy a nice cup of coffee while aboard. I love your blog. Thank you for informing us about such great products. Thank you for the great review. I'm the designer of the AeroPress. And although I'm a lifelong sailor and boat designer (Fast-40 and Etosha), I've only done limited cruising. I was just trying to make a good cup of coffee in my home kitchen. Wow!! You guys love your coffee!! Thank you for your thoughts and stories - I wish I could give ALL of you one of these awesome gadgets! @Alan - WOW! Very cool - thank you for stopping by and for inventing such a great product. On a boat or at home, you did what you set out to do - it sure does make a GOOD cup of coffee! Thanks again! My friend and I shared hours of talks over great coffee in Toronto, Canada. Espresso's, Americano's, Lattes... we drank them all - sometimes in one sitting! Fast forward 20 years and my friend, new to cruising life, just had me on board for my first ever sailing adventure. Her and her hubby were amazing hosts and this would be the perfect thank-you gift! Wow, that is a case of so simple and smart why didn't any think of it yet! Will definitely be looking into that one for my trips. We LOVE coffee, it's so relaxing to sit on the boat and have a hot mug along with dessert of some sort. It's so true that it is a mess on the boat. We don't even take it along with us currently, but if we had one of these we definitely would! ought to publish more on this subject matter. Thanks for sharing this! I got some ideas now. We at Clifton Coffee Roasters love the aeropress , and totally agree with Jo when he/she said- Coffee immediately begins to lose flavour when it is exposed to air. We wanted to create a guide on the aeropress of how we use the aeropress so have a look at http://vimeo.com/105997711 . There is a really catchy tune you will be humming all day. ..
You might have just made a convert out of me. I thought I loved my french press, but now that you mention it... it really is so much trouble to clean for just one cup of coffee. I'm gonna check these out now; hopefully they aren't too pricey! I know about small portable coffee machines which we can use during traveling which I bought from Coffee Machine Supplier in Dubai at affordable price.